The Green Line is Boston's exclusive streetcar line. The Line is a remnant of the many streetcar lines that once ran along Boston's streets in both street-running and right-of-way form. To learn about the four remaining Green Line branches, as well as the subway they all run through, hover your cursor over "Green Line" in the "About the T" section above. But first, stay here to gain some background about what once was. 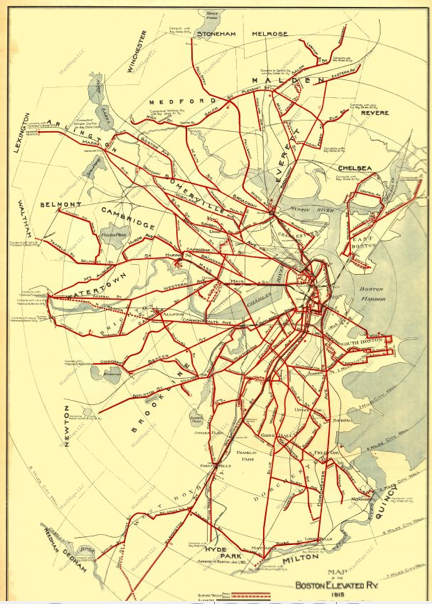 As you can see in the above map, the four Green Line branches have operated for quite a while. Bunker Hill Street in Charlestown when the 93 bus was still a streetcar. Today's rushed drivers would not enjoy negotiating such curves! Once cars such as Ford's Model T made car ownership accessible to the masses, suddenly less people rode the streetcars and more people began to drive. Suddenly, people didn't want narrow streets that limited how fast one could drive, or streetcars that stopped in the middle of the street and could not be passed. Such a desire to accomodate cars gave way to trackless trolleys, and ultimately to diesel buses, that load and unload curbside and make it easier for drivers to drive by. Many roads were also reconstructed, with tracks and trolley islands being demolished to make room for extra lanes with smoother pavement. 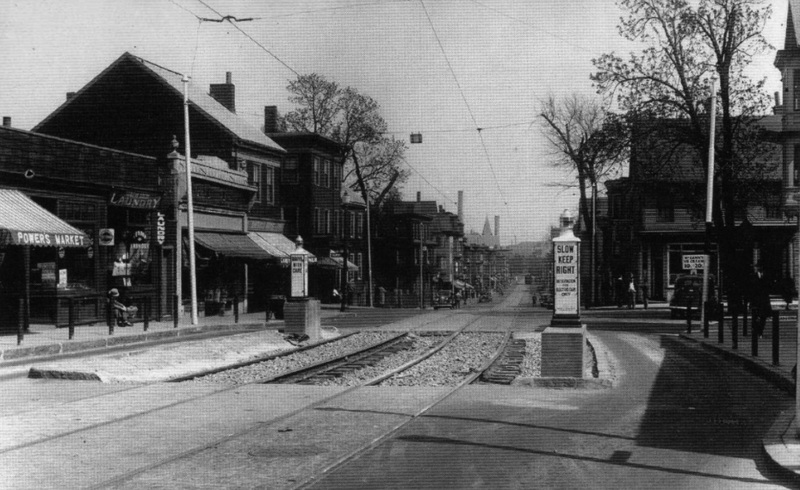 You can get a sense of what driving with trolleys on a typical main street was like by driving on Concord Avenue in Belmont. I have embedded a Google Street View of Concord Avenue below. As you can see, the street is very narrow with one lane in each direction and is built around a concrete median. The median was once the safety island of the trolley that once ran along Concord Avenue. Whenever the streetcar would stop, all the cars behind it would have to stop and wait for the streetcar to start going again. Because of the safety island, the street is much narrower than it would be otherwise; to this day, the speed limit on Concord Avenue is only 20 MPH because the street is not wide enough for the typical 30 MPH. The growth in the popularity of cars is a significant reason why streetcar lines were "bustituted." There are other factors that came into play that are covered in "Why Are There Still Streetcars in Boston?" in the "Articles" section of this website.